Woodlands is a consummate work of art where prodigy Paul Kloschinsky writes, sings, plays guitar, harmonica, produces and even shoots photography for the album cover to create a very cohesive folk album. Intense lyrics explore a wide range of subject matter that is both timeless and elucidating with natural common sense wisdom. The first thing one notices about Paul Kloschinsky is consummate creativity. A poet, artist, photographer, singer-songwriter, and producer, to name but a few occupations, the album Woodlands is a renaissance of expression all from one illustrious performer. For a moment at the beginning, one is thrown off a bit by the lamentation of life and the coarse vocals, but soon swept up by intensifying strings and piano welling up under the acoustic guitar, everything is in its place. Wearin’ Blue harkens to blues and folk dirges circa 1960s style, acoustic and harmonica, but most important, lyrics that strum a chord deep down in the soul. Paul never just writes a blues melody, or a love song, as the introspection is always considering different perspectives. As opposed to the common stereotype of blue being depression, here we are talking about sorrow, a concept all but lost on a satiated culture. The real definition of blue is mystic, and fits mythos made in ancient Gaelic or perhaps Hebrew lore more then anything modern. For these ancient traditions, the color blue was multifaceted pertaining to all the aspects of life shaped by the spirit of the color. The Blue magic, as it is becoming pop-classified, is typically animalistic, and pertains to natural common sense for survival. They are a less spoken of class somewhere between bards, druids, and ovates in Irish lore, taking some skill from each practice and combining them with a wild style, like a wise old hermit. Also, the blue is somewhat literal, as the tuatha Gorm (my own ancient surname, literally means blue in Gaelic, if a reference is necessary) were renowned for running into battle painted blue. You may recognize this from Braveheart, which casually ripped off the heritage, and portrayed it completely wrong; my family ran into battle, weapons in hand, blue and naked. 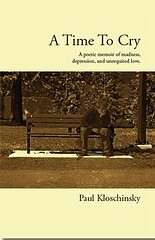 So when Kloschinsky sings “And the wind blows the wasted words that were tried, down to the poets who fought as they died, wearing blue” thinking of my family, it brought me to tears. I can see the millions, not only of my own lineage, but any natives who stood up for their beliefs in nature, and I am right there with him. The tragedy of all the witches and forest people, decimated by the new righteous politico religioso by any name, pick an invader; pick any paranoid reason to massacre the innocent for thousands of years. Generation after generation throwing themselves at the great evolving armies of the world, and yet they carried on saving a multitude of natural wonders merely by living side by side with their environments. Wearin’ Blue is an epic of much sorrow, but understand it is a victory song, redemption of sorts, as the miracle is that these old poems still exist at all. Not all the might of all the empires that ever stood could stop the bards from singing on. Long live the Woodlands! Especially refreshing is Kloschinsky’s ability to mix natural metaphors of the wilderness with modern cultural problems to offer elucidation. Songs like Woodlands, In My Mind, and Whisper of the Wild Weeds give simple explication. “Take a moment, breath the air. It’ll keep you hangin’ on.” It may sound silly, but the worst thing anyone can do in a bad situation is to clench up and hyperventilate. Remembering to take the moment, to actually breath fully, to think instead of panic, is perhaps one of the biggest problems we face. Paired with simple practical advice are the more abstract metaphors of nature, specifically elementals. How quick are we to forget how each bit of nature is required to sustain us. Kloschinsky sees a different world then most. It is clear from his poetry that the natural world is not only very much alive, but that it all flows through us. This is why Paul’s folk-flow is language piercing, adding multiple definitions to each subject, always changing perspective to consider the truth, and the honest truth is unspeakable, forever changing. Beyond the natural world is the nature of culture. “Have you heard the tale of the princess who was jailed in a dark dirty prison where she cried a thousand sleepless nights for the many who had died but fought bravely by her side to the end?” The epic story in the song Seven Riders seems to reach backward through time to mystic history when kingdoms were first being built, and still touches any timeline, as one could picture a new Americas being torn apart by settlers, the princess could just as easily be a cowboy’s sweetie or a native’s beloved. The story is a Mad Libs of every “rescue the princess” type of scenario that ever took place throughout time. It is difficult to even find stories or poetry on this level of epic odyssey. Paul Kloschisky’s works seem to emulate the courage of Homer’s Odyssey, especially the imagery of An Anchor from the Race, yet there is something more there as crazy dreams are allowed to seep into the storyline. A better comparison may be an emerging James Joyce right around the time Ulysses was being written. Ulysses was the commoner’s Odyssey. The peregrinations of the main characters in Kloschinsky’s songs are universal in application just as the affairs found throughout Joyce, or even Dostoyevsky, as the everyday hum-drum life becomes the living natural world, and that every character in life has an equal opportunity to be the hero, the villain, or anything between. With this sort of egoless thinking, elemental understanding, and poetic elegance, Paul Kloschinsky is an amazing story teller. Be it poem, song or art, The Woodlands has been crafted with such deftness that one might say it was grown. The spirit of nature is accurately recorded and translated for us in a way that provides a new take on old answers to many social ills, as coming from the environment and common sense. Not only is it a great album, but a voice that must be heard in this climate of post-modernity mechanization madness. All the resources are gathered around us and now we simply suffer from a lack of good resolutions to our vices. Paul’s wisdom seems to indicate that the key to life is natural and all around, if you but take the time to notice, you will survive. Perhaps that is the secret of blue magic that earned them the title “Immortals.” Woodlands is a timeless album, protected by the wisdom of love for nature and life, validated with the suffering of all who cleared the way before, a blue hymnus of truth.